Never, ever make a bet with your boyfriend. Because you WILL lose it. You will lose it very quickly in fact. I bet my boyfriend that Antonio Brown was going to win dancing with the Stars. I lost. I don’t want to get into too much details on the arrangements of the deal, but let’s just say that he made out wayy too well on this deal. And who even makes this type of deal? Like. What the heck. I was forced to buy a pre workout called Gnar Pump (not to be confused with Go Gnarly's Gnarly Pump Pre Workout) from my boyfriend’s favorite YouTuber, the absolutely repulsive Dom Mazzetti. Ok, so he IS kind of funny. Sometimes. But mostly gross. Lol. But funny. But gross. Anyways. My boyfriend (he actually bought it for me thank gosh), bought me two jars of this ridiculous prep workout supplement for my review. And because I’m the best girlfriend ever, I am going to do a classic pre workout review in my signature style. We’ll start with taste. What’s the Best Flavor of Gnar Pump? 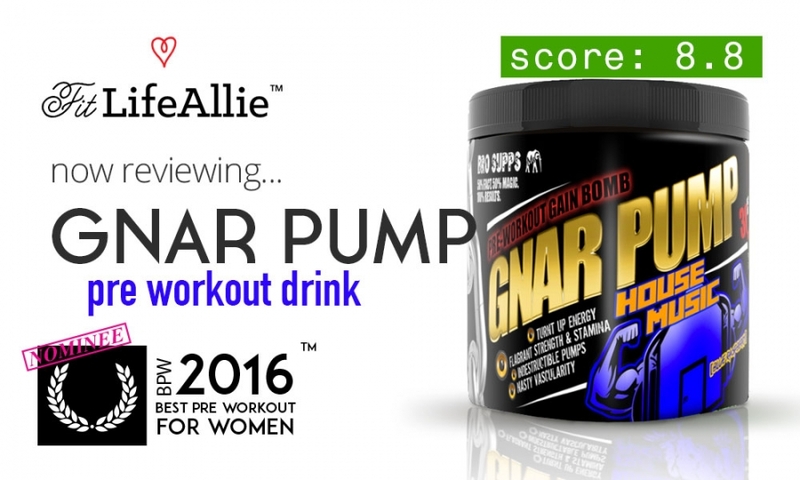 The best flavor of Gnar Pump is actually the blue raspberry flavor. I found that between the ‘Optimus Lime’ and the ‘House Music Blue Raspberry’ the Blue one was much better. Not really what I was expecting. I didn’t try the Komodo Dragon fruit punch because I knew that it would just be the most basic fruit punch flavor ever. The Blue Raspberry, aptly named ‘House Music’ (I guess?) was sweet, and it was tart, and it seemed to be the perfect blend of sweet and sour. Ugh. I actually hate how much I like the flavor! It has a really good berry taste and once you just accept that it is artificially flavored AND sweetened, you can really sort of appreciate it. I thought the Lime was just sort of ‘meh’. It tasted like a standard lemon lime Gatorade. Let’s talk performance now though! Now for the really upsetting part. Gnar Pump works. And it works really well. I took it before my leg day, and even though ‘pump’ isn’t always the most important factor for me when picking my pre workout, I think that the thing that stood out to me most about this pre workout might actually be the ‘Pump’. I was feeling so much volume and fullness in my quads that I actually thought my muscles were like bursting through my skin. It’s not a great look for me when that happens because I just look super masc and people think I’m on steroids. But. That’s just the life of a fit chick that lifts. Lol. Energy-wise, I thought this pre workout is good, but not great. I still prefer something like C4 on energy because I think they’ve really nailed the energy part. But even C4 has it’s drawbacks so I wouldn’t advise that one. My best pre workout list has better options. But getting back to Gnar Pump pre workout…the energy is super clean. Much cleaner than I thought. And probably cleaner than BroScience’s bathroom. LOL. Energy is good, but I thought they could have turned up the heat just a little bit. I thought it started to fade away a little bit. But endurance really wasn’t so bad. I think overall I would give the pre workout an 8.5 on performance. Let’s talk formula now. Creatine: Just because this is where most of the ‘pump’ comes from, and it’s the water getting shuttled into your muscles which give it that ‘full’ look and sort of compromise the definition. I don’t like taking creatine supplements more than every other week so they should have left it out in my opinion. Well. Probably not because it’s mostly guys taking it. But if you’re wondering ‘can girls take Gnar Pump?’ the answer is yes, but just know that it has creatine which is going to fill you out a little and make you a bit ‘puffy’. The artificial flavors and sweeteners don’t always agree with my stomach, which is why this is the only other critique of Gnar Pump that I can find. I think they use a really heavy hit of it, which just makes it a little too hard for my sensitive stomach to handle at times. But. Most folks won’t care about this. Ok, you’re probably wondering why the heck I like this packaging. It’s not that great looking right? Well. Yeah. It’s not. But I always try to grade the packaging based on what is good design in the context of who the customers are, and from that standpoint, I think this pre workout is actually pretty awesome. The flavor graphics are what literally make these designs. The blue raspberry actually has fun electric blue music-themed graphics of a house wearing headphones, and flexing. It makes no sense. But it does. Because ‘bros’ everywhere think it’s awesome. AKA my boyfriend thinks it’s awesome. The lime with the transformers guns is equally as amazing. Lol. I just think it’s clever and fun. Not breath-taking design or art. But it’s just effective and playful. It’s perfect for the Bro Supps brand and that’s why I’m giving him an ‘A’ on packaging. The rest of the labels themselves aren’t terribly remarkable though. Slanted italics with lots of drop shadows and outer glows and stuff. It’s just whatever. But again- it works for them.